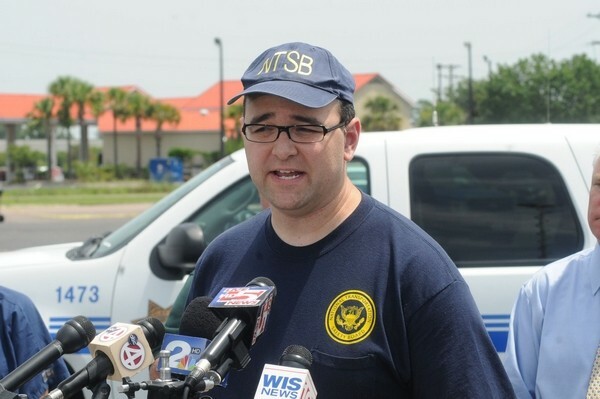 The federal government has conceded it was at fault for the fatal 2015 midair crash between a civilian airplane and a fighter jet over Moncks Corner. The U.S. Attorney's Office submitted its response Thursday to a lawsuit filed in April, according to court documents. The lawsuit alleges the Federal Aviation Administration personnel responsible for air traffic control on July 7, 2015, failed to react appropriately when a Cessna piloted by 30-year-old Joseph Johnson got on a collision course with an F-16 fighter jet piloted by Air Force Maj. Aaron Johnson (no relation). Joseph Johnson's 68-year-old father, Michael, was also aboard the civilian plane. Both were killed. "The United States admits that its employees’ acts and omissions proximately caused the subject accident and resulted in the deaths of Michael and Joseph Johnson," the government's response said. "Accordingly, the United States does not contest its liability for their deaths in this case but does contest the existence, type and quantum of damages available to Plaintiffs." First Assistant U.S. Attorney Lance Crick, a spokesman for the U.S. Attorney's Office in Columbia, said he could not comment on ongoing litigation. Mary Schiavo, an attorney representing the Johnson family for the Motley Rice law firm in Mount Pleasant, called the government's response an important first step. "Obviously it's important for the government to accept responsibility," Schiavo said. "It was certainly appropriate but a bit overdue." Attorneys for the family intend to pursue a jury trial to decide whether the family will be awarded damages, she said. Schiavo also praised the government's attorneys for acknowledging that Joseph Johnson, who was flying the Cessna, was blameless in the crash. The Johnsons' Cessna took off from Berkeley County Airport in Moncks Corner and was headed to Grand Strand Airport in North Myrtle Beach. At 11 a.m., an air traffic control radar received a warning that the airplanes were two miles apart and just moments away from a collision. 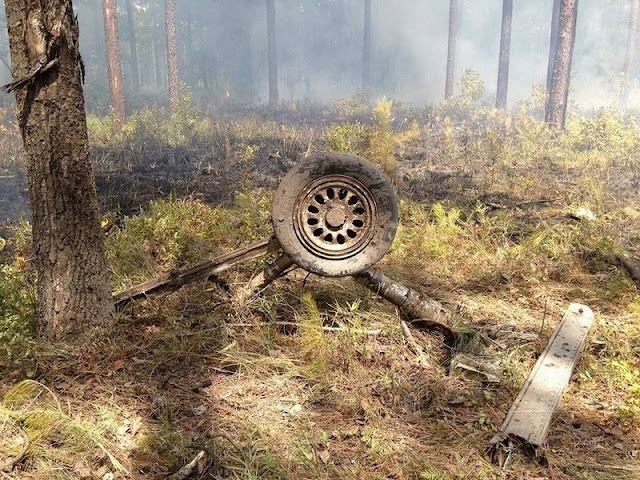 A controller sent an alert to the F-16, at first telling Johnson the Cessna was two miles away and straight ahead. The Air Force pilot was then sent the transmission: “If you don’t have that traffic in sight, turn left heading one eight zero immediately,” according to air traffic control transcripts obtained by Motley Rice. Johnson began to turn the F-16. Seconds later, the fighter jet shore the Cessna in two. 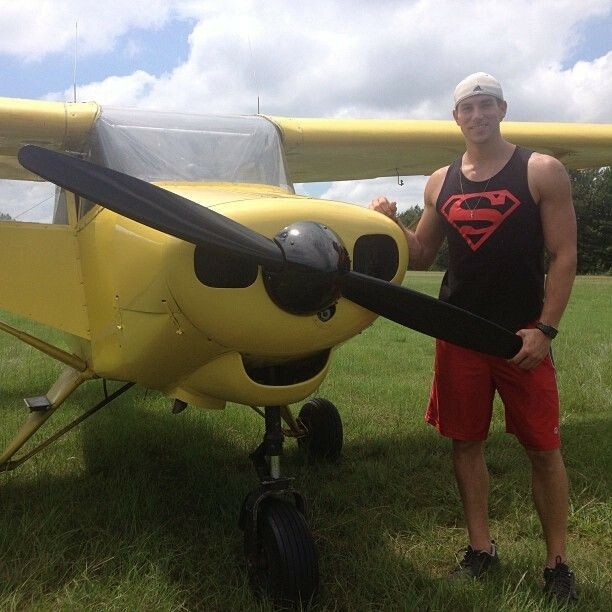 Aaron Johnson parachuted to safety while the civilian plane fell toward the Cooper River. Michael and Joseph Johnson were killed. It was four minutes since they'd taken off. The family of a father and son killed when an Air Force jet cleaved their civilian Cessna in half mid-air over rural Berkeley County filed a wrongful death lawsuit last week against the federal government. The suit, filed by the Motley Rice law firm, alleges the Federal Aviation Administration personnel responsible for air traffic control that day failed to react appropriately to the situation. The FAA “did not take action until a collision was imminent,” attorneys said. Jim Brauchle, lead attorney on the case, said family of the two men killed in the crash feel forgotten. The firm has been negotiating with the government for about six months to no end, Brauchle said. "The families are very disappointed and feel the government hasn’t taken responsibility for this accident," he said. 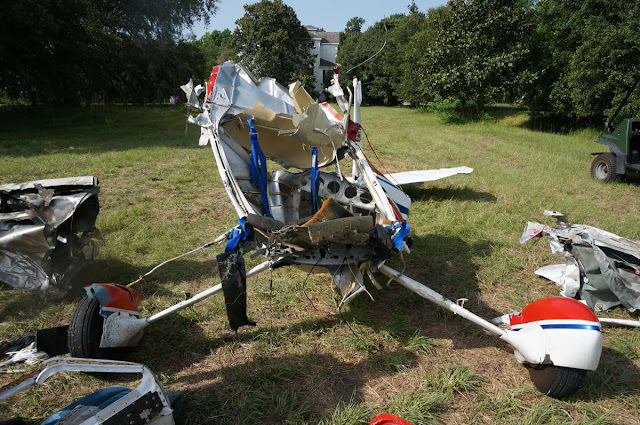 The suit details that the Cessna, a small two-seat airplane, was hit four minutes after taking off from Berkeley County Airport in Moncks Corner on July 7, 2015. Joseph Johnson, 30, and Michael Johnson, 68, were headed to Grand Strand Airport in North Myrtle Beach. Air traffic control radar received a warning at 11 a.m. that the two airplanes were two miles apart and just moments away from a collision. A controller sent an alert to the F-16, piloted by Air Force Maj. Aaron Johnson (no relation), at first telling Johnson the Cessna was two miles away and straight ahead. The Air Force pilot was then sent the transmission: “If you don’t have that traffic in sight, turn left heading one eight zero immediately,” according to air traffic control transcripts obtained by the law firm. Johnson began to turn the F-16. Seconds later, the Air Force plane sliced the Cessna in half, and it careened out of control toward the Cooper River. Both Michael and Joseph Johnson were killed in the crash. Aaron Johnson parachuted to safety. Brauchle, a former U.S. Air Force navigator, said given that a crash was imminent, the controller should have had more urgency. "She gave too much control up to the aircraft, instead of being direct with what he should have done," he said. The government's response to the suit is due July 3. When the controller issued the traffic advisory, about 40 seconds before the eventual collision, the F-16 and the Cessna had a closure rate of about 300 knots. If the F-16 pilot had reported the Cessna in sight after the controller's traffic advisory, the controller likely would have directed the F-16 pilot to maintain visual separation, which is a common controller technique to separate aircraft. While the controller tried to ensure separation between the airplanes, her attempt at establishing visual separation at so close a range and with the airplanes converging at such a high rate of speed left few options if visual separation could not be obtained. The options available to the controller when issuing instructions to the F-16 pilot to avoid the conflict included a turn, climb, some combination thereof, or not issuing an instruction at all. (An instruction to descend was not an option because the F-16 was already at the minimum vectoring altitude for the area.) The controller indicated in a postaccident interview that she chose not to instruct the F-16 to climb because the altitude indicated for the Cessna's radar target was unconfirmed (the Cessna pilot had not contacted ATC). An element informing the controller's decision-making as to which instruction to provide was likely the flow of other traffic into the airport at that time. Arriving aircraft, including the accident F-16, were being sequenced to runway 15 via the final approach course extending from the approach end of the runway. Given the traffic flow, the left turn instruction to the F-16 would have kept the airplane on a heading closer toward, rather than farther from, its destination and would have made returning the F-16 to the intended final approach course much easier. However, the controller's instruction to the F-16 pilot to turn left required the F-16's path to cross in front of the Cessna. Although this decision was not contrary to FAA guidance for air traffic controllers, it was the least conservative decision, as it was most dependent on the F-16 pilot's timely action for its success. Further, the controller issued the instruction to turn left if the F-16 pilot did not have the Cessna in sight. The F-16 pilot responded to the controller's conditional instruction with a question ("confirm two miles?") that indicated confusion about the distance of the traffic. The F-16 pilot's attempt to visually acquire the Cessna per the controller's conditional instruction likely resulted in a slight delay in his beginning the turn. The collision likely would have been avoided had the F-16 pilot initiated the left turn, as ATC instructed, when he realized that he did not have the traffic in sight. About 7 seconds elapsed between the beginning of the controller's first conditional instruction to turn and the beginning of her subsequent conditional instruction to the F-16 pilot to turn "immediately." Analysis of the radio transmission recordings and the F-16's flight recorder data showed that, as the controller was making the subsequent conditional instruction, the F-16 pilot began turning to the left, which pointed his aircraft toward the Cessna. Due to the closure rate, the close proximity of the two airplanes, and human cognitive limitations, the controller did not recover from her ineffective visual separation plan, which placed the airplanes in closer proximity to each other, and switch to an alternative method of separation. The controller's best course of action would have been to instruct the F-16 pilot to turn before the airplanes came into close proximity with each other and preferably in a direction that did not cross in front of the Cessna's path. In postaccident interviews, the controller stated that when she issued the command to the F-16 pilot to turn left "immediately," she expected that the F-16 pilot would perform a high performance maneuver and that she believed that fighter airplanes could "turn on a dime." The FAA's Aeronautical Information Manual (AIM) Pilot-Controller Glossary defines "immediately" as a term used by ATC or pilots "when such action compliance is required to avoid an imminent situation." Further, the AIM states that controllers should use the term "immediately" to "impress urgency of an imminent situation" and that "expeditious compliance by the pilot is expected and necessary for safety." As described above, the F-16 pilot did not meet her expectation that the turn be conducted at a greater-than-standard rate. The controller's expectation of the F-16 pilot's performance was based on her assumption that a fighter airplane would perform a high performance turn to the heading; however, this expectation of performance was not clearly communicated. Based on the controller's instructions and the actions of the F-16 pilot in response, it is clear that the term "immediately" held different expectations for both parties. Although the controller's use of the term "immediately" was in keeping with FAA guidance, further clarification of her expectation, such as directing the pilot to "expedite the turn," would have removed any ambiguity. The see-and-avoid concept relies on a pilot to look through the cockpit windows, identify other aircraft, decide if any aircraft are collision threats, and, if necessary, take the appropriate action to avert a collision. There are inherent limitations of this concept, including limitations of the human visual and information processing systems, pilot tasks that compete with the requirement to scan for traffic, the limited field of view from the cockpit, and environmental factors that could diminish the visibility of other aircraft. The collision occurred in a relatively low-density air traffic environment in visual meteorological conditions (VMC). The Cessna was equipped with an operating transponder and single communication radio but was not equipped with any technologies in the cockpit that display or alert of traffic conflicts, such as traffic advisory systems, traffic alert and collision avoidance systems, or automatic dependent surveillance-broadcast systems. The Cessna had departed from a nontowered airport and was still in close proximity to the airport when the collision occurred. The Cessna pilot had not requested or received flight-following services from ATC at the time of the collision, nor was he required to do so. Based on his proximity to the departure airport, it is reasonable to expect that the Cessna pilot likely was monitoring that airport's common traffic advisory frequency (CTAF) for awareness of airplanes in the vicinity of the airport, as recommended by the FAA's AIM. Based on statements from the Cessna pilot's flight instructor and from his logbook entries, which both cited past experience communicating with ATC, it is also reasonable to assume that had the collision not occurred, the pilot likely would have contacted ATC at some point during the flight to request flight-following services. Due to the Cessna's lack of technologies in the cockpit that display or alert of traffic conflicts and the pilot's lack of contact with ATC, his ability to detect other traffic in the area was limited to the see-and-avoid concept. While not required, had the Cessna been equipped with a second communication radio, the pilot could have used it to contact ATC while still monitoring the departure airport's CTAF. Had the Cessna pilot contacted ATC after departing and received ATC services, the controller would have had verification of the Cessna's altitude readout and its route of flight, which would have helped her decision-making process. The controller also could have provided the Cessna pilot awareness of the F-16. The F-16 was operating under IFR in VMC. The F-16 pilot's ability to detect other traffic was limited to the see-and-avoid concept, supplemented with ATC traffic advisories. While the F-16 pilot could use the airplane's tactical radar system to enhance his awareness of air traffic, it was designed to acquire fast-moving enemy aircraft rather than slow-moving, small aircraft and was thus unable to effectively detect the Cessna. (The radar system did detect a target 20 miles away, which is likely what led the F-16 pilot to question the location of the traffic that the controller had indicated was 2 miles away.) The F-16 was not otherwise equipped with any technologies in the cockpit that display or alert of traffic conflicts. The F-16 pilot did eventually visually acquire the Cessna but only when the airplanes were within about 430 ft of one another, about 1 second before the accident. A factor that can affect the visibility of traffic in VMC is sun glare, which can prevent a pilot from detecting another aircraft when it is close to the position of the sun in the sky. For the F-16 pilot, the sun would have been behind and to his left as the airplanes approached one another. Although the Cessna pilot would have been heading toward the sun, the sun's calculated position would likely have been above a point obstructed by the Cessna's cabin roof and would not have been visible to the Cessna pilot. Thus, sun glare was not a factor in this accident. Our aircraft performance and cockpit visibility study showed that, as the accident airplanes were on converging courses, they each would have appeared as small, stationary, or slow-moving objects to the pilots. Given the physiological limitations of vision, both pilots would have had difficulty detecting the other airplane. Specifically, the study showed that the Cessna would have appeared as a relatively small object through the F-16's canopy, slowly moving from the center of the transparent heads-up display (HUD) to the left of the HUD. As the F-16 started the left turn as instructed by the air traffic controller, the Cessna moved back toward the center of the HUD and then off to its right side, where it may have been obscured by the right structural post of the HUD. It was not visible again until about 2 seconds before the collision. (Figures 3a and 5a in the factual report for this accident show the simulated cockpit visibility from the F-16 at 1100:18 and 1100:56, respectively.) The F-16 pilot reported that before the controller alerted him to the presence of traffic, he was actively searching for traffic both visually and using the airplane's targeting radar. He reported that after the controller advised him of traffic, he was looking "aggressively" to find it. By the time he was able to visually acquire the Cessna, it was too late to avert the collision. Our investigation could not determine to what extent the Cessna pilot was actively conducting a visual scan for other aircraft. Our aircraft performance and cockpit visibility study showed that the F-16 would have remained as a relatively small and slow-moving object out the Cessna's left window (between the Cessna's 9 and 10 o'clock positions) until less than 5 seconds before the collision. Given the speed of the F-16, the Cessna pilot likely would not have had adequate time to recognize and avoid the impending collision. Because the Cessna pilot was not in contact with ATC and was relying solely on the see-and-avoid concept, an indication of approaching traffic might have allowed him to visually acquire the F-16 and take action to avoid it. While most systems are limited to aiding pilots in their visual acquisition of a target and do not provide resolution advisories (specific maneuvering instructions intended to avoid the collision), the augmentation of a pilot's situational awareness might allow the pilot to change the flightpath in anticipation of a conflict and, thus, avoid airplanes coming in close proximity to one another. The Cessna pilot might have noted the presence of the F-16 and its level altitude of about 1,600 ft as he continued his departure climb. With this information, the Cessna pilot might have arrested his airplane's climb as he began a visual search, thus creating an additional vertical buffer between his airplane and the approaching F-16. While the F-16 pilot's visual search was augmented by the controller's traffic advisory, a successful outcome would have depended upon the pilot's visual acquisition of the target airplane in time to take evasive action. Our in-cockpit traffic display simulation showed that the F-16 pilot might have first observed the Cessna when it was about 15 nm away, or nearly 3 minutes before the collision. As the F-16 closed to within 6 nm of the Cessna, or slightly more than 1 minute before the collision, the conflict might have become even more apparent to the pilot showing that not only were the airplanes in close proximity laterally but also that they were only separated vertically by 600 ft. As the F-16 pilot was beginning his left turn as instructed by ATC, the presence of the Cessna would have been aurally annunciated, and its traffic symbol would have changed from a cyan color to a yellow color. The information presented on the in-cockpit traffic display would have clearly indicated that the airplanes were on a collision course that might not be resolved by a left turn and that the vertical separation between the airplanes had decreased to 300 ft.
Consequently, an in-cockpit traffic display could have helped the F-16 pilot recognize the potential for a collision in advance of the controller's instruction to turn left. The earlier warning also could have provided him additional time to conduct his visual search for the Cessna and potentially take other preemptive action to avoid the collision. Had the F-16 been equipped with a system that was able to provide the pilot with resolution advisories, the F-16 pilot could have taken action in response to that alarm to avoid the collision, even without acquiring the Cessna visually. In November 2016, we issued safety recommendations to the FAA and Midwest Air Traffic Control, Robinson Aviation, and Serco (companies that operate federal contract towers) to (1) brief all air traffic controllers and their supervisors on the ATC errors in this midair collision and one that occurred on August 16, 2015, near San Diego, California; and (2) include these midair collisions as examples in instructor-led initial and recurrent training for air traffic controllers on controller judgment, vigilance, and/or safety awareness. After the accident, the Cessna's departure airport engaged in several outreach efforts (including posting midair collision avoidance materials locally and having outreach meetings with pilots) to raise awareness regarding midair collisions and encourage contact with ATC. The airport also updated its chart supplement to note the presence of military and other traffic arriving at and departing from CHS. The approach controller's failure to provide an appropriate resolution to the conflict between the F-16 and the Cessna. Contributing to the accident were the inherent limitations of the see-and-avoid concept, resulting in both pilots' inability to take evasive action in time to avert the collision. Savannah-based Gulfstream Aerospace Corp. announced Monday that it continues to add resources for operators in the Asia-Pacific region, home to the company’s largest and fastest-growing international fleet. “Our Asia-Pacific fleet grew by 25 aircraft in 2016 and is now well over 300,” said Derek Zimmerman, president of Gulfstream Product Support. “Strong customer response to our aircraft over the past several years in the region, especially Greater China, has resulted in us building a significant support presence there, which we enhance and supplement whenever possible. Zimmerman is in Shanghai for the Asian Business Aviation Conference & Exhibition, which runs Tuesday through Thursday. Three Gulfstream business jets – the super-midsize G280, the high-performance G550 and the company flagship G650ER – are on display. ABACE is Asia’s biggest business aviation event, bringing together the most influential providers of business aviation products and services with the entrepreneurs, decision-makers and others using business aircraft. It’s also an opportunity to strengthen business ties. Gulfstream now has 314 aircraft operating in Asia-Pacific region. More than 180 of those are based in the Greater China region, which encompasses China, Hong Kong, Macau and Taiwan. Zimmerman said the company has strengthened its depth of customer support in the area, doubling the number of field service representatives in Hong Kong from two to four. The company also has two field service representatives in China and one each in Japan, Singapore, Australia and India. At Gulfstream Beijing, the first factory-owned business jet service center in China, technicians have serviced more than 600 aircraft in the facility’s four-plus years of operation at Beijing Capital International Airport. 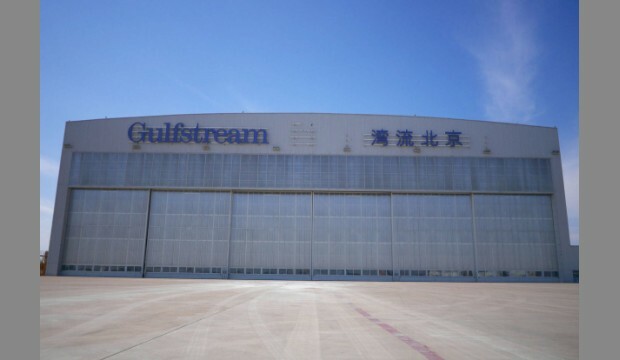 Earlier this year, Gulfstream Beijing was certified as an authorized maintenance organization by the Cayman Islands, which means the site’s technicians can perform maintenance on aircraft registered in that British territory. They are also authorized to work on most Gulfstream aircraft registered in the U.S., China, Macau and Hong Kong. To support its growing fleet in the Asia Pacific, Gulfstream maintains a parts inventory of approximately $55 million, strategically placed in Hong Kong, Beijing, Singapore and Melbourne. Savannah-based Gulfstream Aerospace Corporation, a wholly owned subsidiary of General Dynamics (NYSE: GD), designs, develops, manufactures, markets, services and supports a line of technologically advanced business-jet aircraft. Gulfstream’s fleet of business jets includes the Gulfstream G280, G550,G500, G600, G650 and the G650 ER. Gulfstream also offers aircraft ownership services via Gulfstream Pre-Owned Aircraft Sales. PORTSMOUTH — A squadron of F-15C fighter jets that have stayed at the Air National Guard Base at Pease will begin leaving early Tuesday morning. David Mullen, the executive director of the Pease Development Authority, acknowledged they won’t be going quietly. “We do get calls when that happens,” Mullen said. The PDA issued a “community advisory” on Monday, letting area residents know that the F-15Cs would be leaving Pease. “Consequently, area residents may perceive a significant noise event as a result of the jet aircraft departures,” she added. The F15Cs will begin leaving at 3 a.m. on Tuesday, with six jets leaving the airport, followed by six more at 5 a.m. on Wednesday and the final two at 7 a.m. on Thursday, airport officials said. The jets are part of the 493rd U.S. Air Force wing out of England. 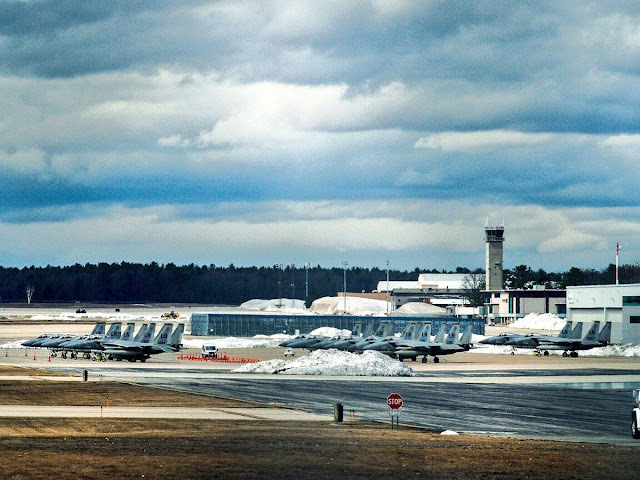 Andrew Pomeroy, airport operations manager for the Pease Development Authority, said pilots from the 493rd wing landed at Pease on Sunday, April 2. The 493rd fighter squadron, who are nicknamed the “Grim Reapers,” are part of the Air Force’s 48th fighter wing, and are located at RAF Lakenheath, England. Apr 10, 2017- A captain of the Nepal Airlines has been arrested with a huge amount of undeclared United States dollars from the Tribhuvan International Airport (TIA) in the Capital on Sunday. According to SSP Chabilal Joshi of the Metropolitan Police Range, Kathmandu, captain Subarna Awal was nabbed with USD 93,000 while he was entering the airport for a flight to Dubai last night. Following the incident, captain Mahesh Man Dangol was assigned to fly the NAC flight RA 229 to the destination. The pilot reported that, during the landing roll as the tailwheel was almost in contact with the ground, the airplane started to veer to the right. He attempted to correct to the left but lost directional control, and the airplane ground looped to the left. The airplane sustained substantial damage to its right wing and firewall. The automated weather observation system on the airport reported that, about the time of the accident, the wind was from 340° at 10 knots, gusting to 17 knots. The pilot landed on runway 23. The pilot’s failure to maintain directional control during the landing rollout in gusting crosswind conditions. The pilot reported that during the landing roll as the tailwheel was almost in contact with the ground, the airplane started to veer to the right. He attempted to correct to the left, but lost directional control, and the airplane ground looped to the left. During the ground loop, the airplane sustained substantial damage to its right wing and firewall. The automated weather observation system on the airport, about the time of the accident, reported the wind at 340° at 10 knots, gusting to 17 knots. The pilot landed on runway 23. Aircraft after departure, fuel tank cover separated from aircraft. Aircraft on landing, ground looped and wing struck the ground. On April 7, 2017, at 1250 eastern daylight time, a Cessna 414, N56H, was substantially damaged while attempting to land at Fulton County Airport-Brown Field (FTY), Atlanta, Georgia. The airline transport pilot was not injured. The airplane was registered to Aeromack LLC and operated under the provisions of 14 Code of Federal Regulations Part 91 as a personal flight. 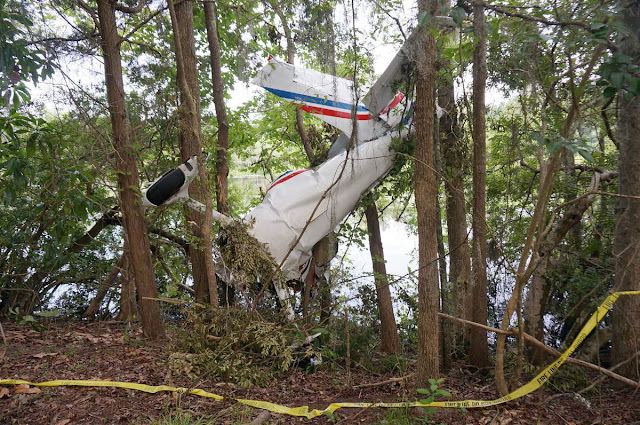 Visual meteorological conditions prevailed near the accident site at the time of the accident, and an instrument flight rules flight plan was filed and active for the flight, which originated from McKinnon St Simons Island Airport (SSI), Brunswick, Georgia. The pilot stated that while at 400 ft on a 1-mile final to runway 32 at FTY, a multiengine airplane was cleared onto the runway in front of him. This occurred at a point in the approach when the pilot normally would have completed his final pre-landing checklist/call-out, which consisted of checking the fuel, flaps for approach, landing gear down, and approach stabilized. The pilot also stated that the winds were "howling" with gusts to 25 knots. He stated that the other airplane on the runway was a "distraction" and that he did not "remember doing my usual call outs." The pilot continued his approach as the other airplane cleared the runway. During landing, the pilot felt the airplane settle and he attempted to pull up, but the airplane continued to descend onto the runway. He heard what sounded like "tires screeching" followed by the fuselage scraping along the runway. When the airplane came to a stop, the pilot reported that the landing gear handle was in the down position and the circuit breaker was in the off position. 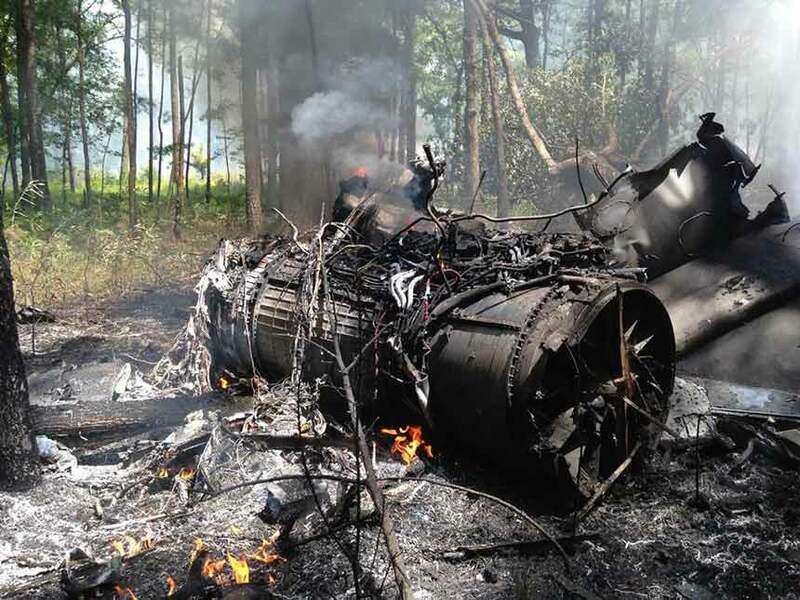 A Federal Aviation Administration Inspector examined the airplane after the accident,t and confirmed that both engines and propellers were damaged. The underside of the fuselage was also structurally damaged. In addition, the landing gear doors exhibited abrasion through their entire thickness. On April 7, 2017, at 1835 eastern daylight time, a Piper PA-22-135 airplane, N2389A, impacted terrain during landing at Greensburg Municipal Airport (I34), Greensburg, Indiana. The private pilot received minor injuries and two passengers were uninjured. The aircraft sustained substantial damage. The airplane was registered to and operated by the pilot under the provisions of 14 Code of Federal Regulations Part 91 and was not operating on a flight plan. Visual meteorological conditions prevailed for the personal flight that departed from Upper Cumberland Regional Airport (SRB), Sparta, Tennessee, about 1535, and was destined to I34. The pilot stopped for fuel at Lagrange-Callaway Airport, (LGC) LaGrange, Georgia, and then departed at approximately 1330. The second fuel stop was SRB and then departed at approximately 1535 and was destined to I34 to refuel again. The pilot stated that I34 did not have automated weather reporting. He slowed the airplane to look at the wind sock during approach. As the airplane slowed, it "slowly" banked left. He said the airplane was responsive with increased speed. He performed a 360 degree turn and rolled out onto the runway for landing on runway 36. As the airplane slowed, it banked left and landed in a field left of the runway. The airplane impacted the ground in a field approximately 300 feet west of the centerline of the runway and skidded approximately 200 feet before coming to a stop. Post-accident examination of the airplane by a Federal Aviation Administration maintenance inspector from the Indianapolis Flight Standards District Office confirmed flight control continuity. No mechanical anomalies were noted with the airplane that would have precluded normal operation. On April 7, 2017, at 1835 eastern daylight time, a Piper PA-22-135, N2389A, impacted terrain near the Greensburg Municipal Airport (I34), Greensburg, Indiana. The pilot received minor injuries and two passengers were uninjured. The aircraft sustained substantial damage. The airplane was registered to and operated by the pilot under the provisions of 14 Code of Federal Regulations Part 91 and was not operating on a flight plan. Visual meteorological conditions prevailed for the personal flight that departed from Upper Cumberland Regional Airport, Sparta, Tennessee, at 1535, and was destined to I34. The airplane was on approach to runway 36 at I34 when it experienced an uncontrolled left roll. The pilot attempted a forced landing but impacted terrain.